Scientific name: Nigritella nigra (L.) Rchb.f. Synonymname: Gymnadenia nigra (L.) Rchb.f. Gymnadenia, Gymnos, naked and adên gland, referring to the lack of protection for the pollinia or pollen grains. The standard author abbreviation Rchb.f is used to indicate Heinrich Gustav Reichenbach (1824 – 1889), a German ornithologist, botanist and the foremost German orchidologist of the 19th century. The Swedish name Brunke ulla already stated by Linnaeus as a jämtländskt name of the species. 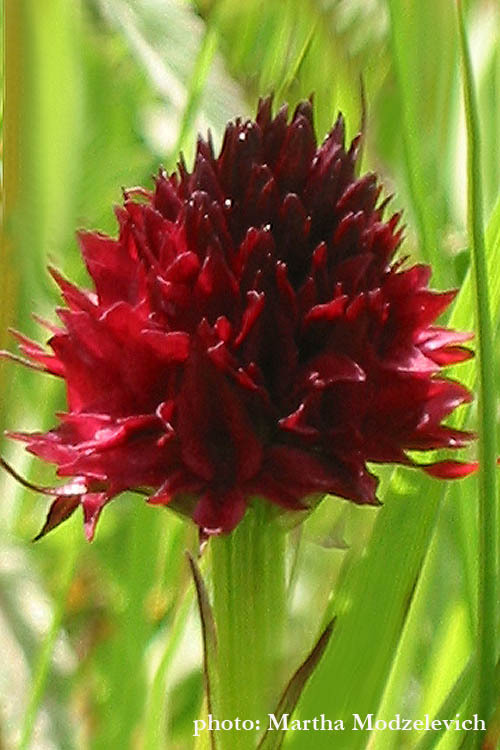 Brunkulla (Nigritella nigra, Gymnadenia nigra) is Jämtlands Province flower. Brunkulla is rare and occurs only in the Jämtland, Härjedalen and Lycksele Lapp Mark. It grows in limestone-rich grasslands, such as hay meadows.